Infected with an airborne virus with a uniquely unsettling symptom, property developer Jason escapes London for his country estate, where he is cared for by two young women who are squatting in his house. When more survivors arrive seeking sanctuary, tensions increase. With the established order under threat, events begin to spiral out of control. ​These two stories interweave, illuminating each other in unexpected ways and offering long vistas of loss, regeneration and wonder. The Book of air is a compelling, character driven tale of survival in a post-apocalyptic future. Beautifully paced, it weaves between Jason’s life in a society imploding in on itself when a deadly virus kills millions and Agnes’s in a community regenerating from the ruins. A gripping dystopian fantasy… Treasure writes with fluency and pace and his characters are flawed and believable. This story is so clever and original that I started recommending it to friends 3% into it! Simply put, The Book of Air is original, compelling and hopeful. A must-read for all dystopian fans. The Book of Air is written wonderfully, composed like a musical composition… This would be a fabulous book for a book group! A testament to the resilience of the human spirit. The plotting is brilliantly done, unravelling multiple interconnecting narratives. The two strands of the tale shed light on each other, creating a whole that is far bigger than its parts. The characters are intriguing…. Joe Treasure has created an extraordinary piece of work, beautifully crafted and full of gems. 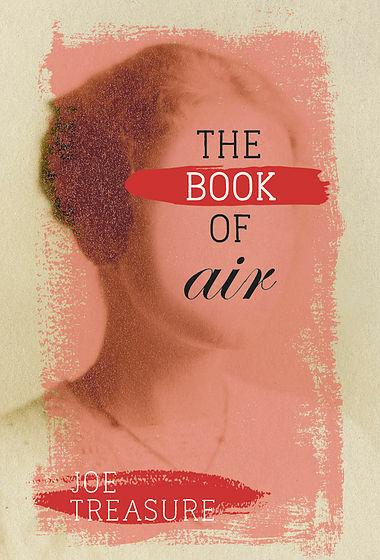 ​The Book of Air is a story of survival, the shaping of memory and the enduring impulse to find meaning in a turbulent world. Here’s a 3-minute trailer with readings and interviews.